Lila Vivian Newman, 73, of Olathe, KS passed away April 14, 2016 at Pinnacle Ridge Nursing and Rehab Center. Funeral service 12:00 noon Fri., April 22, 2016 at Evangelistic Center Church of Olathe, 700 E Loula St, Olathe, KS. Burial follows 2:30 pm Leavenworth National Cemetery, Leavenworth, KS. Visitation 6:00 to 7:30 pm Thur., April 21, 2016 at the church. Memorial contributions may be made to the Evangelistic Center Church. Lila was born April 2, 1943 in Beckley, WV, to Arthur Chester and Garnet Garlean (Marrical) Sweeney. She married Donald Alvis Newman in Santa Ana, CA on Oct. 22, 1961. They lived in California while Don served in the Navy. After his retirement in 1977 they moved to Olathe. Lila was the owner/operator of Sweeney’s Tiny Tots Preschool. She later worked for ten years as a kindergarten teacher at Olathe Christian School. 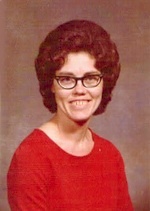 Lila was a member of the Evangelistic Center Church of Olathe. She enjoyed teaching, reading and cooking. Her children and grandchild were a focal point of her life. She will be dearly missed by family and friends. She was preceded in death by her parents and husband, Donald in 2012. Lila is survived by son, Donald Lynn Newman, Independence, MO; daughters, Dana and husband Rex Simmons, Richmond, MO and Dorothy Newman, Olathe, KS; sisters, Linda and husband Benjamin Piccirillo and Alberta Maxwell both of Spring Hill, KS and Garnet and husband Jeffrey Rosenwirth, of Cadiz, KY; brother, Arthur and wife Karen Sweeney, II, of Olathe, KS and one granddaughter, Melody Rose Simmons.